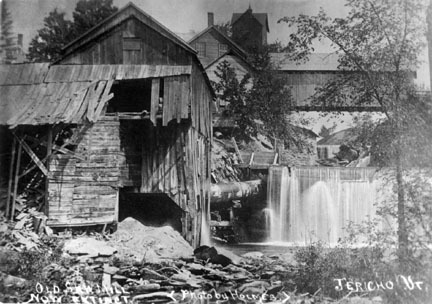 On the Brown’s River within the town of Jericho, there are seven “water privileges”, which is to say, sites where a mill could be located. Of these, six have been used. Site #1, just south of the bridge over the river on Route 15 at Jericho Corners, had a sawmill built by Joseph Sinclair before 1836 on the west side of the river. This mill did a thriving business under the successive ownership of Truman Barney, Truman Galusha, L.B. Howe, Henry Parker, R.M. Galusha, Alexander McLane & Rodney Barney, George Wright, Walter Debuc, and was owned by E.W. Curtis when it was washed away in a flood in 1903. The site was then sold to Joseph Williams and Charles Laughlin, who established the Jericho Granite Co., using the water power to run the air compressor used in the granite shed. Granite was shipped into Jericho by freight train, and transported to the shed by team, where it was cut to specified sizes and shapes. One of the more noted pieces crafted here was the Civil War monument which still graces the town green in Westford. Mr. Williams died in 1915, and for a short while, the sheds were closed. They then were re-opened by Carl Densmore and Sons, who operated them until about 1930. This site is located behind the present day Keith’s Insurance Agency. In the center of the photo can be seen the back of Jed Varney’s blacksmith shop, and above that, the cupola of the Chittenden Mills grist mill. On the right is the covered bridge spanning Brown’s River.